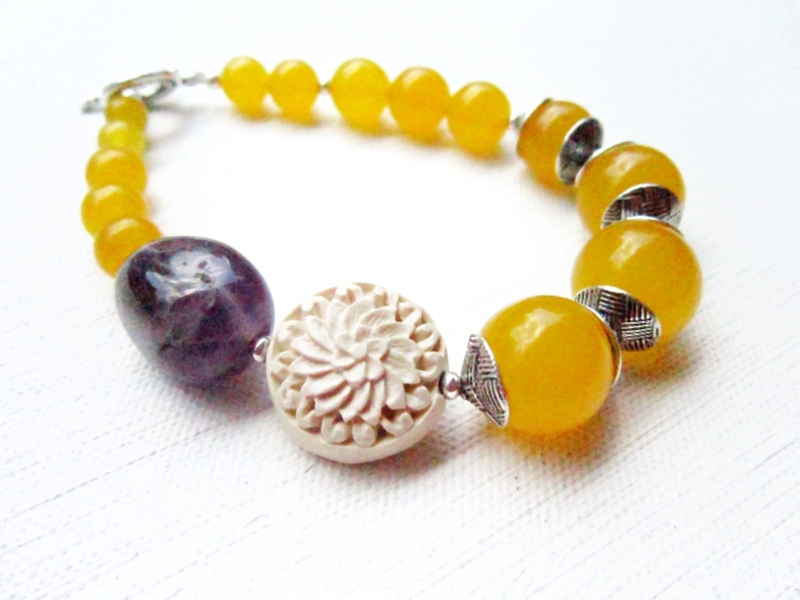 I photographed this bracelet on a beautiful sunny day. 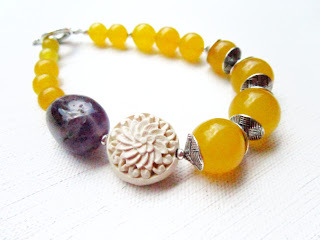 The yellow jade looked amazing and I hope I've captured its beauty alongside the purple, silver, and cream tones here! I love this bracelet! 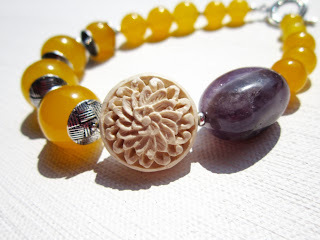 The Lillian bracelet is lovely, one-of-a-kind, and the first bracelet in my Lillian collection inspired by purple and gold Thai water lilies. Lillian features yellow jade, which is looks amazing in sunlight (as shown above). Even in lower light, the jade is a beautiful, Meyer lemon-like yellow. Antiqued silver bead caps with a woven-like texture showcase four larger jade stones. A deep purple amethyst bead and carved cinnabar lotus flower in a creamy white hue help complete the bracelet. This bracelet is 9" long, fits a wrist or arm up to 8", and closes with a Tibetan silver toggle clasp. Although this bracelet will fit a larger woman's wrist best, it drapes well on my 6" wrist. 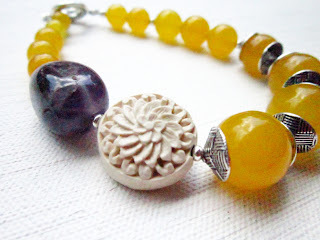 Update 8/29/2011: Featured in an Etsy treasury!